Home » Landscape Design » Simple Landscape Design Ideas. People are always perplexed at what to put in their landscape. How many? How should I arrange them etc. Pam and I decided to dress up the front of this place, but we wanted to keep it really, really simple. This is what we did . . . The design on both sides of the walk is basically the same. Doesn’t have to be, but that’s what we decided for here. We wanted it to be as maintenance free as possible, so that means no fast growing trees or shrubs. Right out of the gate I broke a fundamental landscaping rule. Each bed has not one, but two specimen plants. Why? Because I like them and I had them on hand. I liked them so much that I didn’t want to sell them to anybody. Our plant selections are pretty simple simple. Evergreen Azaleas because the grow slow. Blue Rug Juniper because they grow slow and are super easy to care for. Firewitch Dianthus because they are awesome when in bloom, still nice when not in bloom and tough as nails. Two different kinds of Dwarf Japanese Maples. Wanna watch a movie about this design? Okay, here it is . . .
More photos of the plants? Okay, here they are . . . This Karina Japanese maple is an awesome little plant. I’ve had these in the nursery for several years, probably since 2012 and it’s still only one foot tall and wide. Perfect place for it here by the walk. You just can’t beat an evergreen azalea in a landscape. Hardy, slow growing, easy to care for and a burst of color in the spring. Each bed has 3 Azaleas, 3 Dianthus, 3 Blue Rug Juniper and two Dwarf Japanese Maples. The maples are very different. The Karina has red leaves and even though it is super slow growing, it is an upright plant. The Japanese maple in the center is a Weeping Japanese maple but unlike most Weeping Japanese maples this one has variegated leaves. Being a Weeping Japanese Maple this tree will not grow tall, but in time will grow wide and low. All of the new growth cascades off the center of the plant. Of course with some careful pruning these two trees will grow into amazing specimens. This landscape design is simple, elegant in it’s own way, about as maintenance free as you can get and it’s attractive and will stay that way for years because of the plants that we selected for this job. Questions, comments, mean things to say? Post them below and I will reply appropriately. I have no experience with cedar mulch so I can’t really offer much. I have followed you for a long time and used many of your ideas but never started selling! I now live in zone 7 in eastern Washington and trying to plant along our driveway wanting something a little unique instead of hedges and river rock. I am struggling because it is on a slope…. Your landscape project looks beautiful as they all have in the past. Any ideas for low growing zone 7 plants growing no more than 3×3? I have a few in there now, to include dwarf day lilies, a cute little juniper, barberry, karl forester grass, peony and I have some pots of sedums to plant. I still have lots to fill in and a decision on mulch. Thanks for your posts, very interesting and informative. I envy people in zone 7 because you really have the best of growing conditions. Never too hot or cold. Many of the weigelas are great for landscaping as are lots of other shrubs and perennials. I really like blue mouse ears hosta and mini skirt hosta and both seem to tolerate some sun. Hi Mike! Found your website by accident but glad I did! We are currently building a home in Randolph ohio. We should be in by December. Does your company deliver and plant or are you a nursery that sells outright? Needless to say we’ll have to plant grass and landscape. Any advise you have will be appreciated! No, we don’t deliver or plant, those days are over. Search https://mikesbackyardnursery.com/, lots of articles on lawns and landscaping on my site. What zone. Was this ? Well, we used to be zone 5, I say we still are, USDA says we are now zone 6. Great job Mike. Landscaping doesn’t have to be complicated to look good. during the growing season. Some plantings get crowded out because they grow so fast.. Thanks for showing that simple can be attractive. PS. Your landscape design video helped me more than anything. This plant selection needs little care during the growing season. We trimmed the azaleas after they bloomed, we trim the Japanese maples a little as needed and dead head the dianthus. That’s about it. I wonder with all your landscape designs about the orientation, i.e. north south east west facing. Is that a factor when you design/plant your landscapes? Thanks! Never. Or seldom is it something I think about. I might not put an evergreen azalea on the smoking hot south side of a house, other than that I give it little to no consideration. Thing just don’t have to be that complicated. Mike, you said simple and I agree. Many times there is more complexity in making something “simple” really look good. One thing I noticed. You said in previous videos that you didn’t like the wood chip mulch, but it appears that is what you used – black dyed shredded wood mulch. How come? *Not criticizing!! It looks great. Just trying to learn the reasoning. You are right. For the longest time I wouldn’t use it. But hardwood bark fades so fast and looks bad that my wife kinda pushed me toward the dyed mulch and I like it. It looks good for at least two years. What in the world is that gray stuff in the foreground of the photos? Is that gravel? Also is that not black colored ground up mulch that we have all learned to stay away from in normal use? Yes, this building is actually a commercial building so the front is gravel parking. And yes, that is dyed mulch and because it holds it’s color so well I have started using it. Contrary to what I’ve said in the past. Mike did you move? This doesn’t look like the home you usually show on your blog. My Bloodgood Japanese Maple seems to have sunk down in the ground somewhat. It leafs out beautifully, is reddish all season long, around 8 ys old. Problem is I naively planted it in a very loamy soil mix to replace the clay down here in the south and didn’t know at the time that they are supposed to be planted with the trunk about an inch or so above the soil line (let alone use composted cow manure instead). I even tried to dig it out when it was around 3 yrs old but it wouldn’t budge! The roots are down in there for good. I have put some good soil on top around it each spring but don’t want to cause it to get Verticillium wilt or root rot by applying too much at a time (also put some pine bark mulch around it to help preserve moisture but don’t let it touch the trunk). In addition do a very light pruning before leafing out as needed and finger-prune any sprouts on the trunk (when I first got it it also had 1/3 branches with green leaves coming out too, thought it looked pretty cool but read on one of your blogs that it was most likely part of the faster tree it was grafted on to, so removed all of them). Should I add even more soil or would that smother the roots/only make sink down even more? Would GREATLY appreciate any ideas you have! We are in the process of building a house, should be done by fall. I don’t like what you say about your Japanese maple and adding more and more soil is not good at all. A professional could dig that tree for you in November. Thanks Mike, truly value and appreciate your opinion!!! Love how you beautifully landscaped your other home featuring (my personal fav) Japanese Maples, and your new home is already looking very nice too! The black mulch also has grown on me, it really shows off red, white, and especially yellow-colored flowers or bushes like gold mop/false cypress or euonymus. We switched back from red to brown dyed-mulch; then in recent years to pine bark nuggets, mostly because they are in bigger chunks that don’t break down as fast and can last for years, tho initially requires more bags. Pine bark nuggets also blend better imho if you have a lot of fallen leaves like we do every fall. Some folks are now attempting to revitalize their faded mulch with renewal sprays in choice of red, brown, or black. I do wonder if that makes the mulch even more flammable? I just “fluff” mine up with a rake, almost always looks better. Over the years red-dyed mulch seems to have become the standard for numerous commercial plcs. Think that is why (at least in my area) many homeowners today have changed from red (compared with only 10 years ago or so when red mulch was all the rage). 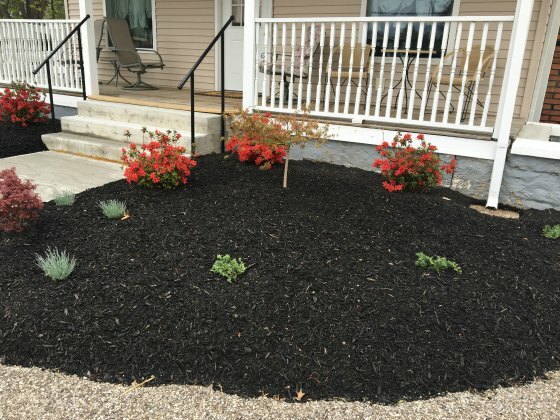 The popularity of black mulch, once regarded by many as “fake-looking”, is now spreading fast as its offers appealing contrast to many plants that other mulch colors can’t match. One can go online and search for before & after using black mulch to get an idea of how it might change their landscaping they already have in place. Sometimes the result is downright eye-popping! And in part I don’t think hardwood bark mulch is what it used to be. Seems that it used to hold color better than it does now. I don’t care for red mulch, but it is popular. Don’t think I do, sold them all. Hi, Mike. I like the plant selections and placement.They will fill in slowly but not become unmanageable . I woukd have chosen a lighter colour mulch, but that’s a personal preference. Is that charcoal mulch, Mike? No, the mulch is dyed wood chips. Something I would have never used years ago. But it does look nice. 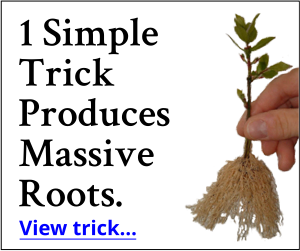 My question is: when can I try to transplant a one-foot Japanese maple seedling? Now or have to wait for fall after frost? My original, beautiful, 25-ft tall Japanese maple got some infection and died two years ago. But,several of her seedlings have taken root and I would like to use them. Thanks Mike for your years of helpful suggestions, warmth, and gardening inspiration. Your community is making the world a better place! I’d be patient and move it after Thanksgiving. Or in the very early spring. Rose chafer war!!!!!!! N. Michigan garden being eaten alive- How to save my plants?????? I’d consider a bayer product if you want to use a spray. Very simple design Thank you. What kind of mulch would I use that won’t be washed away from our Texas down-pours! Being in Texas you have to use what is available but most mulch stays put unless along a sidewalk that fills with water. I am looking for a weeping redbud. any left? and what size? also a mock orange. also what size? No weeping redbuds, I hope to have some for spring.